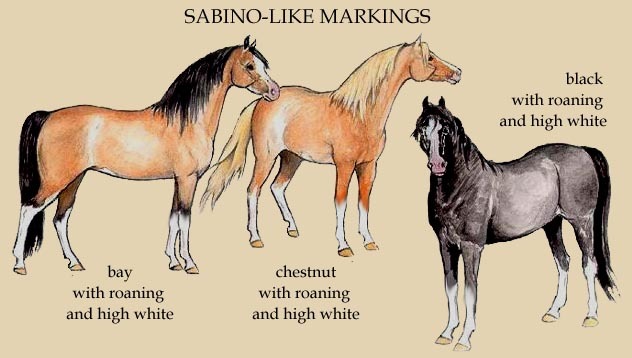 It has become commonplace, in Morgans as well as in other breeds, to call any horse with flashy white markings not due to another pinto pattern (especially if those markings are roaned or patchy) "sabino". 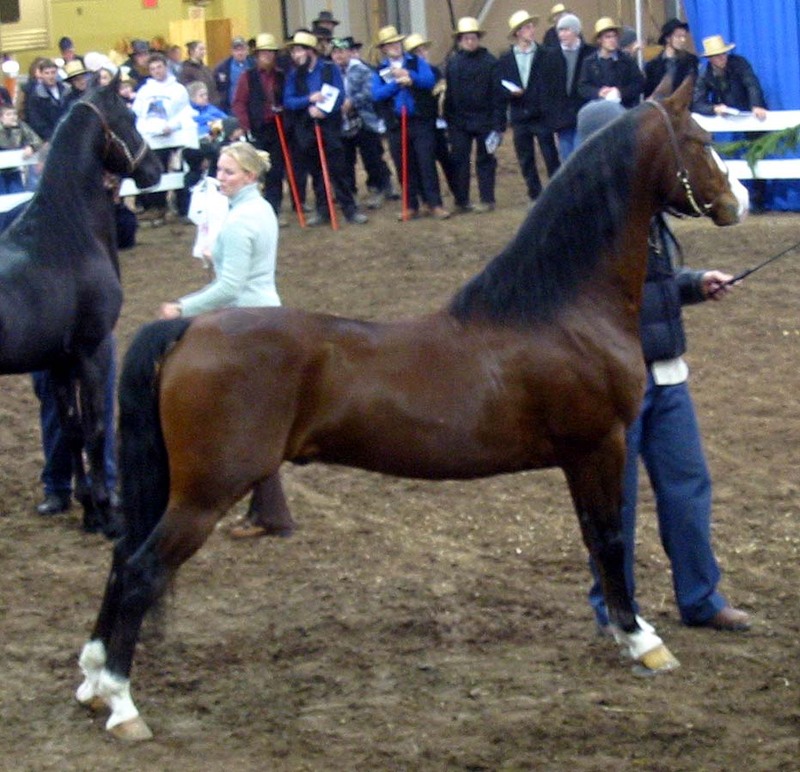 In 2005, the causative gene for the sabino pattern, Sabino1, was identified and a SB1 test became commercially available. 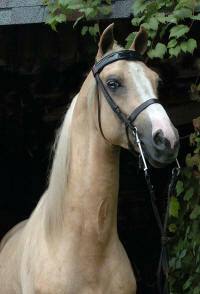 Heterozygous Sabino1 horses have flashy, often roaned or flecked, white markings; homozygous Sabino1 horses will be almost pure white in appearance. No Morgans that have been tested for Sabino 1 through the AMHA Registry have yet tested positive for this gene. I am not aware of what particular bloodlines have been tested. It may be that some lines of Morgans are indeed SB1, so we need more owners of flashily marked Morgans to test and report their results. To avoid confusion, breeders should not call their flashy white Morgans "Sabino" unless they have test results that verify the presence of Sabino1. Further complicating the issue is that there is no consensus on what to call horses who have a sabino appearance but are tested to not be Sabino1. On this site we will refer to them as "sabino phenotype", "sabino-like" or "high white" because of their phenotypic similarities to actual Sabino1 horses. These similarities include high white stockings, a blaze that often wraps around the chin, an overall sprinkling of roaned hairs or roaned patches, and perhaps a belly spot or two. The markings may have jagged or lacey edges, and the hind leg white tends to travel upwards in a point towards the front of the stifle. 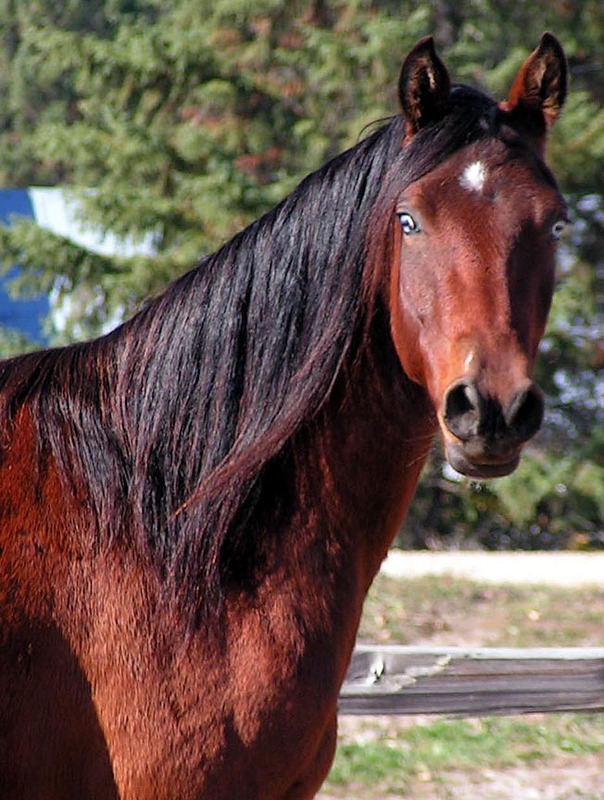 There may be an increase in the number of roaned hairs as the horse ages, and these roany examples can be mistaken for true, dark headed roans. 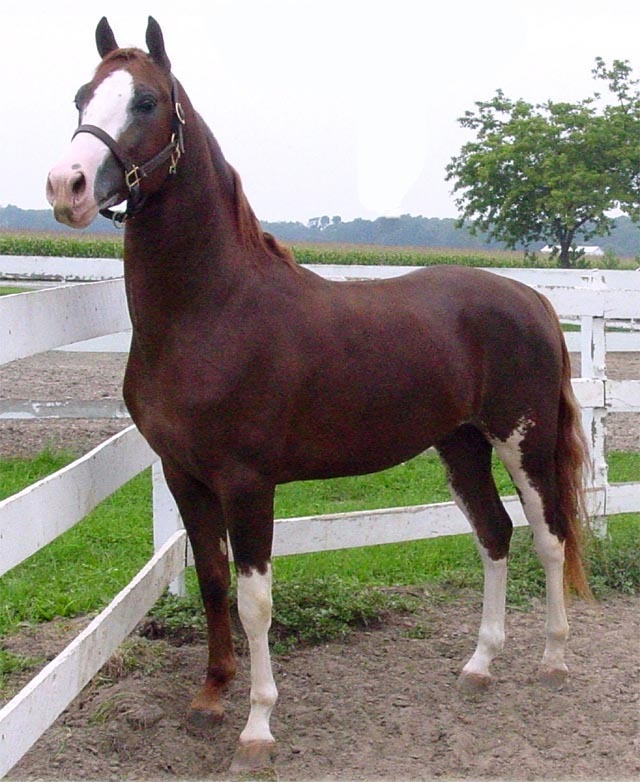 High white markings are fairly common in the Morgan breed, and run strongly along certain family lines. Old government breeding (particularly horses from Devan and Orcland Leader lines), some Lippitt families, and descendants of Menomin Flash Dancer and Aljaks Double Whammy are all strong sources of flashy white markings. There are also bloodlines that produce blue eyes to go along with their flashy white, but when tested, have not been found to be splash. The most prolific producers of this blue eyed, high white phenotype include Farceur Morgan (possibly coming through his sire Kings River Morgan); Serenity Flight Time (especially through his grandson Cedar Creek Harlequin); Moorewood's Excalibur; and Ancan True Colors (possibly coming from Paramount's Nominee, or Foxfire, both of whom had quite a bit of white and are behind his dam). 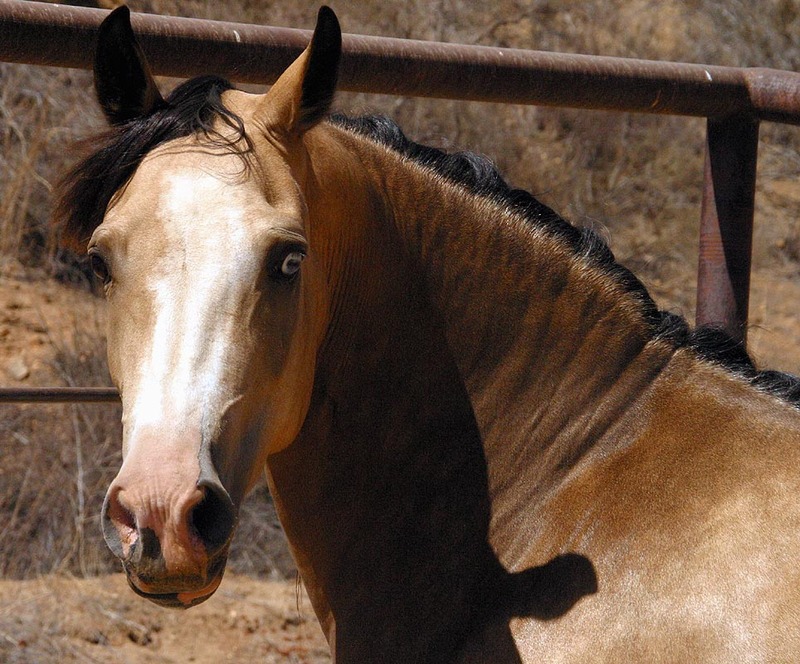 Researchers originally expected to discover additional Sabino mutations in the KIT locus, where Sabino1 is found (which would perhaps account for those sabino-like horses who did not test to have SB1). That has not happened. What has been discovered is another series of mutations in KIT that were originally called Dominant White, but now are labeled White Spotting- the "W" series of genes. 21 of them have been identified so far, and most are specific to a single breed. Only one White Spotting/Dominant White mutation, W20, has been found in the Morgan breed, according to the research on this mutation. W20 is thought to be a white "booster"- in other words, it enhances the amount of white on a horse when combined with other pinto patterns. W20 may be present on some of the sabino-like horses in the Morgan breed, augmenting another pattern or patterns that are so far unidentified and unable to be tested for. There is now a test for W20 available through Animal Genetics for $25; they also offer the sabino test. The W20 test is part of their Dominant White panel. Please consider testing your Morgan, and please email me your results and be sure to send me a photo for this site. I'd like to make a separate page for tested positive W20 Morgans. We just need more folks to test and report their results! This page might have been better titled "flashy/roany white markings and/or blue eyes of currently unknown cause"! I've included a number of examples of such horses here. As time goes on, more and more discoveries are being made in the field of color genetics, and in the not so distant future we may well find out the genetic cause(s) for a lot of what you see on this page. 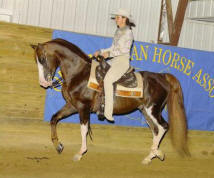 REGAL CHARADE (War and Peace x RRG Flash Dance) 2003 chestnut stallion owned by Erin Lilienthal. "Riley" shows the same type of sabino-like markings common to other Morgans pictured on this page from the same bloodlines of Century Free Spirit and Cedar Creek Harlequin, who are his grandsires. Riley tested negative for W20, SB1 and splash, so whatever is causing his flashy white is at this time unknown- like the rest of horses on this page! 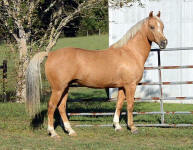 GONE GOLD (Adiel's Casino Gold x Kennebec Topaz), 2002 palomino gelding owned by Laura Behning, Brookridge Morgans. "Roadie" has one partial blue eye, three white socks and a roany, crooked star/strip/snip. He tested negative for both splash and W20, but has not been tested for SB1. 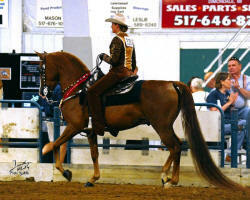 MENOMIN FLASH DANCER (DPR Noteability x WR Corianna), 2001 chestnut gelding owned by Nicolle Nowosielski. Before he was gelded in 2009, Flash Dancer produced 16 foals, and quite a few had his high white markings, like the next horse. ULTRA'S EZ DOES IT (Menomin Flash Dancer x RWF Wild Child) 2005 chestnut gelding owned by Nancy Rebman and ridden by Nancy's grand daughter. 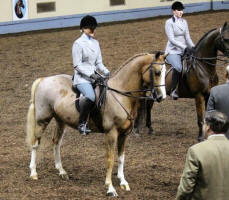 ALJAK'S BRITE LIGHTS (Aljak's Double Whammy, by Century Free Spirit x Century Oak Denali), 2008 chestnut gelding owned by Margaret and Laura Foley (pictured as a weanling on the left, and as a 4 year old on the right, with Kelly Kraegel up at the 2012 Morgan Grand National and World Championship Horse Show). "Beamer" shows quite a bit of roaning and he also is covered in Bend Or spots- of two different shades, one redder and one more liver. 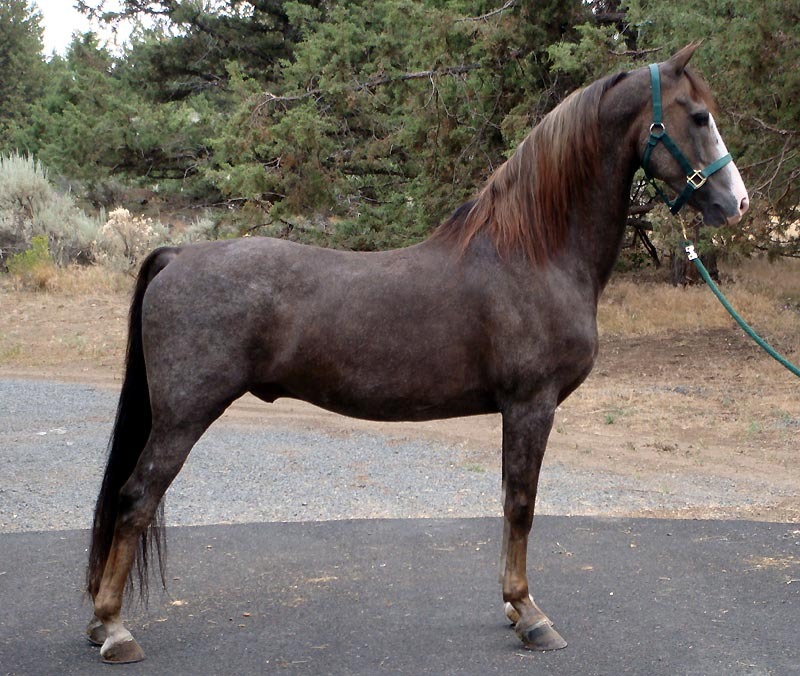 Bend Or spots are named after a famous racehorse of the same name who had them. Not much is known about them or how they are inherited. The pointy-topped, flecked edges on Beamer's stockings are a typical feature of the "sabino phenotype" horse. First photo courtesy of Ken Martin; second courtesy of Kris Breyer. UNRAVELED (Centerpiece x WWW Virtual Reality), 2006 bay mare owned by Chelsey Abate. The silver tail on this mare could be due to several causes. Such white tails are called "Gulastra Plumes" (or simply "silvertail") in the Arabian breed, because so many of Gulastra's descendants had this silvery white tail. 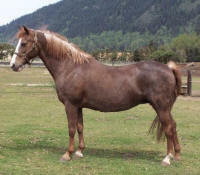 A white tipped tail is often a feature of splash, but this mare is not from known splash lines. 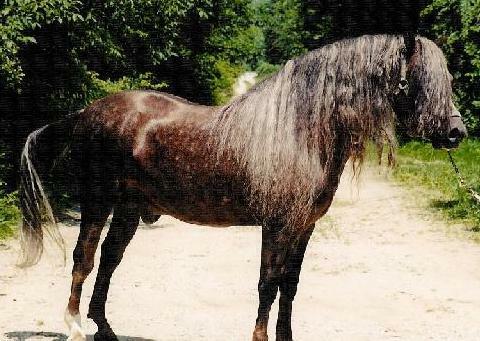 The Serenity lines in her pedigree are known for throwing light bays with silvering in the mane and tail, some of whom look like wild bays. 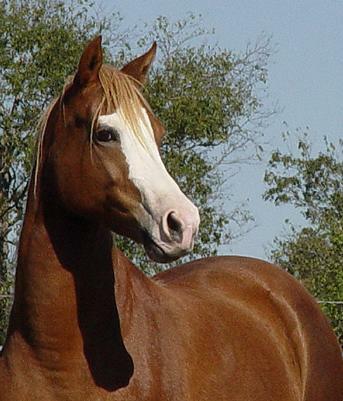 This mare also has a line to Cedar Creek Harlequin, known for throwing flashy white markings. Photo by Andy Illes. 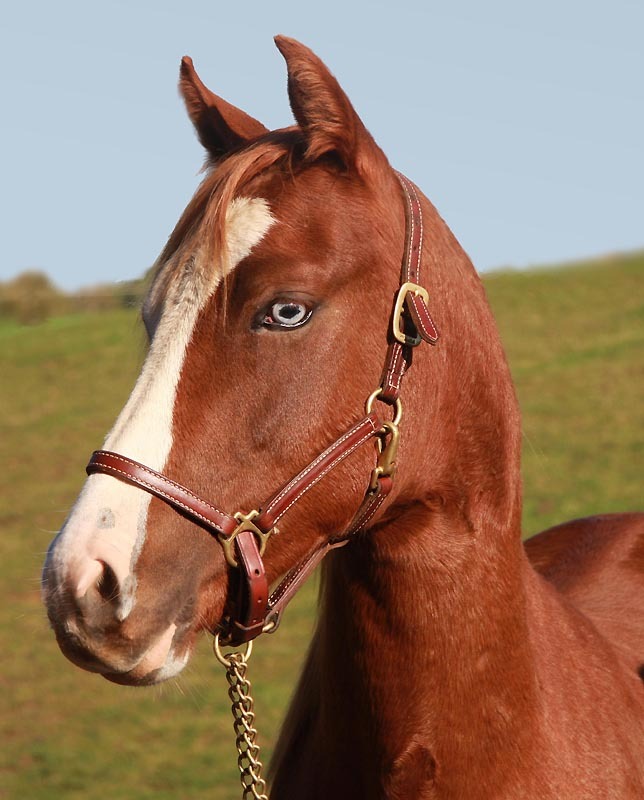 THUNDER PANDORA (SMS Comet x Futuritys Beaujolais), 2010 chestnut filly bred by Don and Michelle Dilley, Thunder Morgan Farm. Pandora's blaze with its tiny "kissy spots" are typically thought of as "sabino". An interesting feature is her right hind roaned "sock". 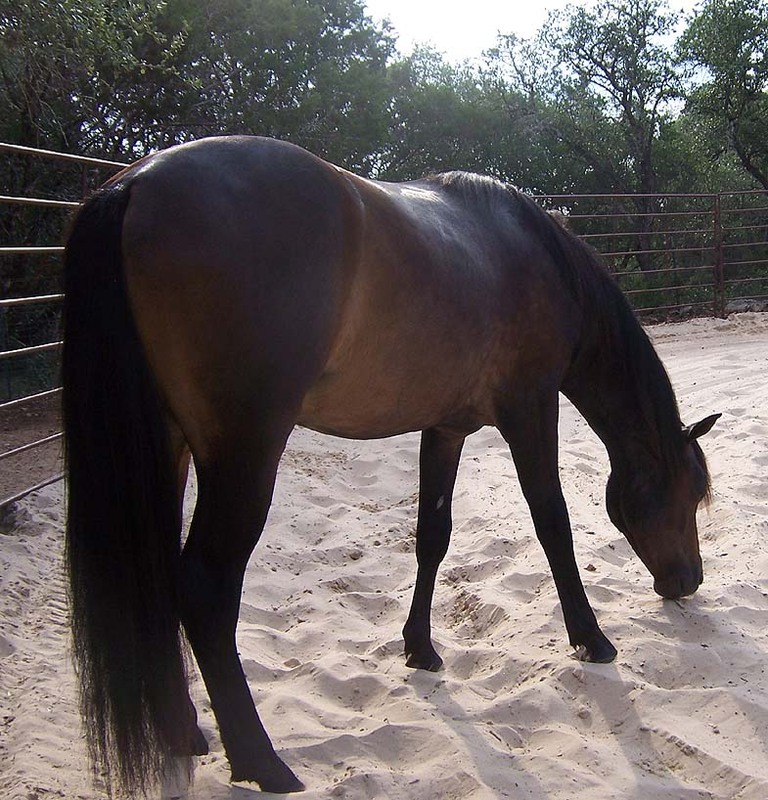 Though the filly was young (6 months old) when these pictures were taken, she had fully shed her foal coat; the lighter hairs are not foal coat remnants, but a roaned marking. Roany patches and markings are a feature of both Sabino1 and the sabino phenotype. QUEEN NELL (Linsley Boy x Cotton Queen), 1978 chestnut mare and her 1989 bay colt GENERAL THEODORE (by Chantwood Charterson). Nell is a wonderful example of a roany sabino phenotype. Although not visible here, Nell had a white spot on the other side of her belly. 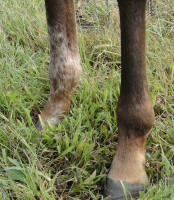 If you look close you can see a detached spot on the front/inside of her right hock. 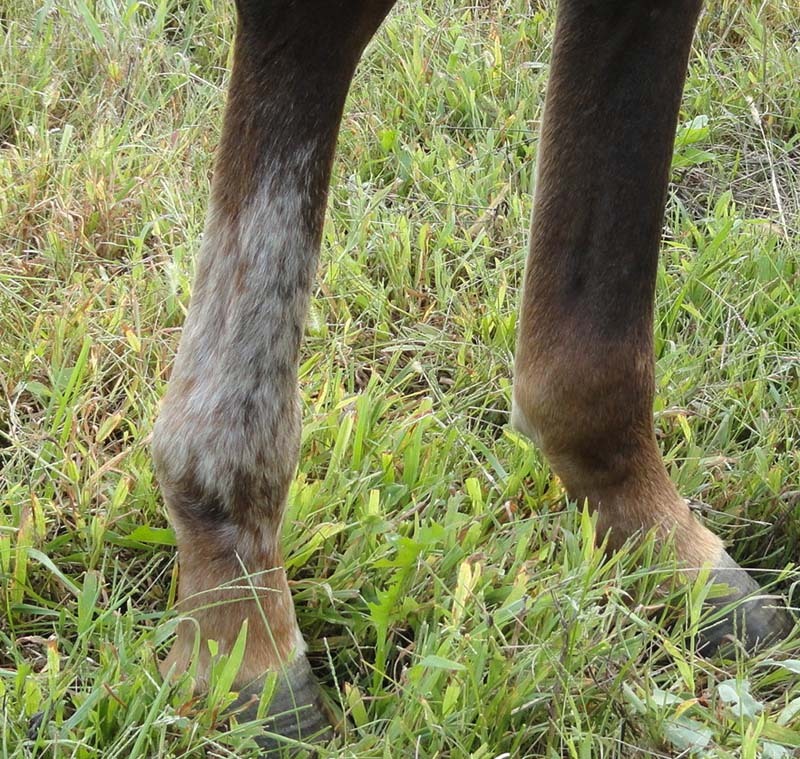 Detached white markings on a knee or hock are a feature of both Sabino1 and the sabino phenotype. Queen Nell had been an Amish driving horse - doing at least 11 miles per day on blacktop every day of the year. It destroyed her joints. 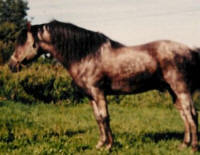 After having General Theodore in 1989 and a chestnut full sister, One Exception, in 1990, she was humanely put down in 1993 due to arthritis problems. Neither of her offspring are as colorful as she was. Photo courtesy of Sharon Harper. CELEBRITY PANACHE (Century Free Spirit x Heyday Star Beam), 1999 chestnut gelding owned by Celebrity Morgans. Century Free Spirit, a flashy white-marked chestnut himself, often sired liberally marked chestnuts with roaning, like Panache and his half sisters Hyland Acres Chantel and Lady Chablis (both shown elsewhere on this page). LADY CHABLIS (Century Free Spirit x J L's Leading Rheda), 1995 chestnut mare owned by Tanner Coy Cosby. Another roany offspring of Century Free Spirit. Photo by Meagan Ferrence. 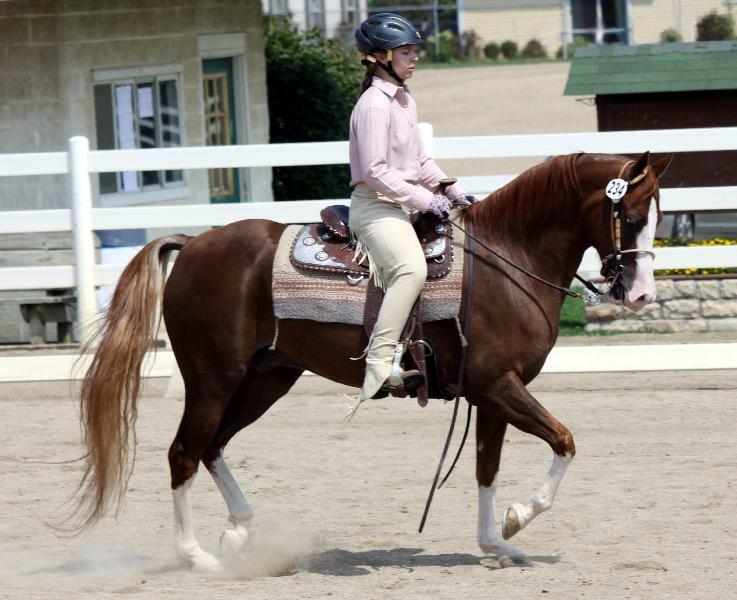 SEASON'S SIMPLY SUPREME (EF Hot Wheels X Acoma Tiger Lily), 2004 bay mare owned by Colleen McNichol. Roaned patches are traditionally thought of as sabino features. 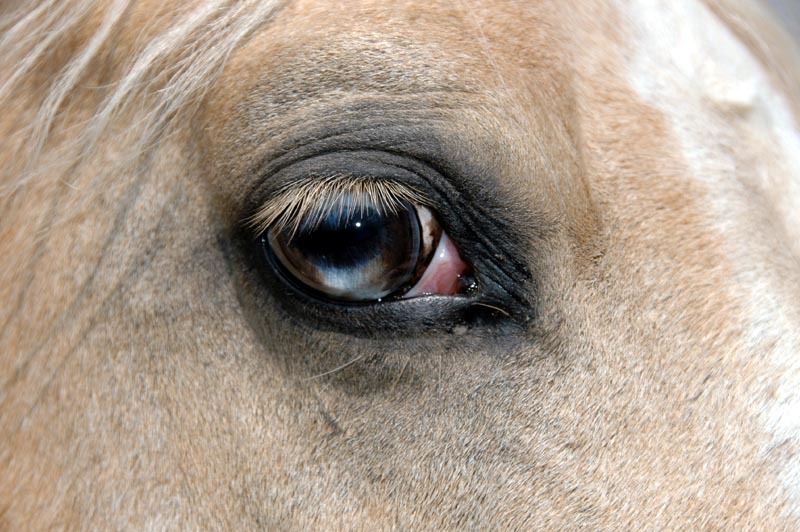 Some horses may acquire more of these patches over time. 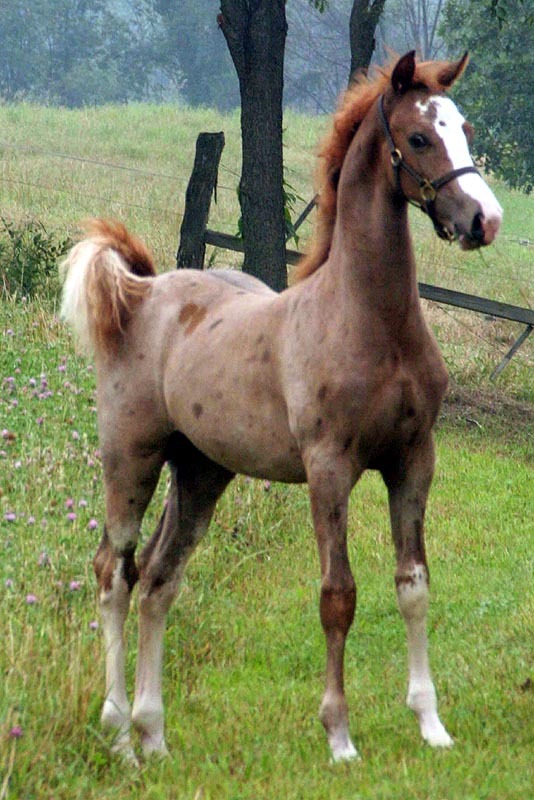 The actual genetic cause of this mare's marking is unknown. Photos courtesy of Colleen McNichol. 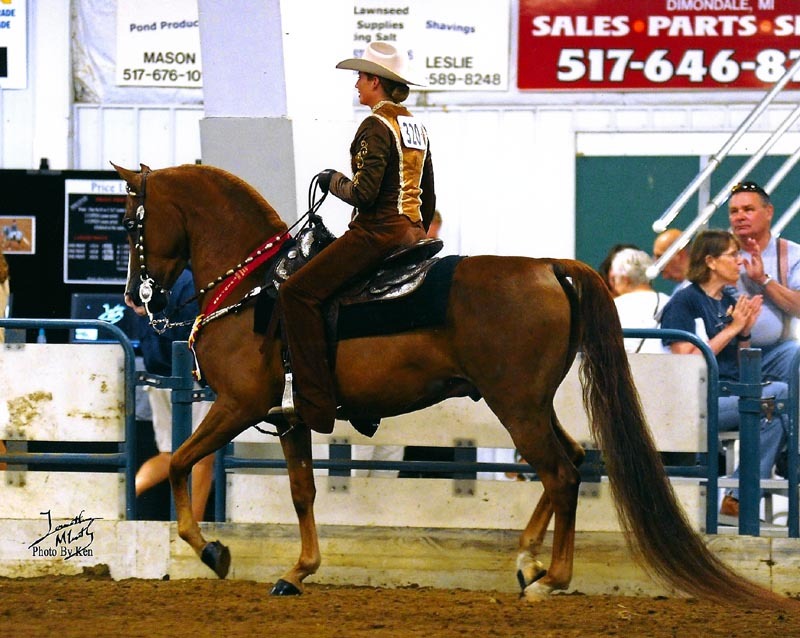 MEMC PAINT'N THE TOWN (High White Revolution X MEMC Lickety Split), 2004 chestnut gelding owned by Emily Sims. "Payton" has a belly spot and a white spot on his left hip as well as a blaze and three white stockings. Erika Bronstrup, up. Photo courtesy of Erika Bronstrup. HYLAND ACRES CHANTEL (Century Free Spirit X Excess Princess), 1990 chestnut mare. 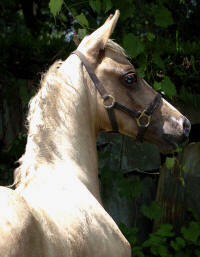 The addition of white hairs in the mane and tail is one of the "sabino phenotype" characteristics. 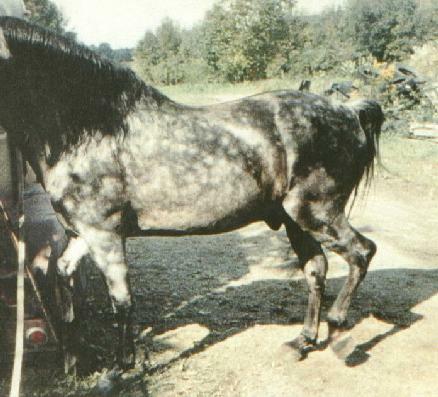 When this occurs on bay and black horses, without much concurrent body roaning, such horses can be mistaken for silver dapple. Chantel also shows body roaning and a big blaze with chin white, both of which are common in sabino-like horses. Photo courtesy of Sandra Nichols of Ensbrook Morgans. 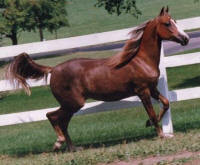 CENTURY FIRST LADY (Fiddler's FirstComand X Century Spiritess), 1992 chestnut mare. 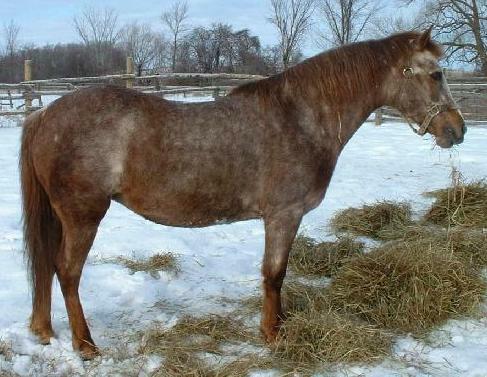 Lady's dam is a full sister to Century Free Spirit; it is not uncommon to see sabino-like markings from these lines. Like her cousin Chantel, shown above, she also has body roaning, white hair in the roots of the mane and tail, and an interestingly shaped blaze- and not much in the way of leg white (none, actually!). Full body photo by Hal Hoover. Photos courtesy of the mare's owner, Barbara Darby of Litchfield CT.
AWEE BLAZE OF GLORY (SP Captain Hook x Hicourt Cachet) 1998 chestnut mare. Photo courtesy of Jennifer Monroe. 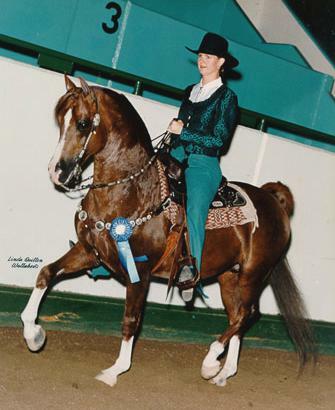 PKF CLASSIC SPATS (Shakers Sheridan X Downers Debutante) 1985 chestnut stallion owned by Colleen McNichol, Four Seasons Farm, Jordan, MN. Photo by Linda Quillen Wollaber. STARSPANGLED PUMPKINEATER (Royal Oaks Gaylark x Sirrah Victoria), 1997 chestnut mare, registered as grey- notice the roaning, especially concentrated on her hindquarters? 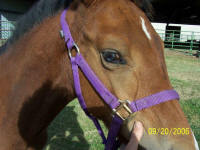 Her breeders were not sure what color this mare was! Owned by Marcia Meurs of Ramona CA. Ridden here by Marcia's daughter Mary. 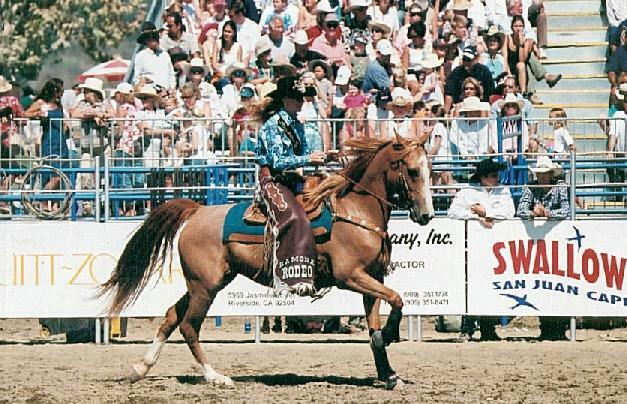 Mary, mounted on "Kitty", won the title of Ramona Rodeo Junior Queen and the duo spent 2002 representing Ramona at the PRCA Rodeos in Southern California. Kay Levie photo. The late SLEEPYS SELECT ROSE (Middland Lipp A Tink X Sleepy's Fuzzy Fanny), 1983 chestnut mare owned by Tammy Kastner of Ontario. 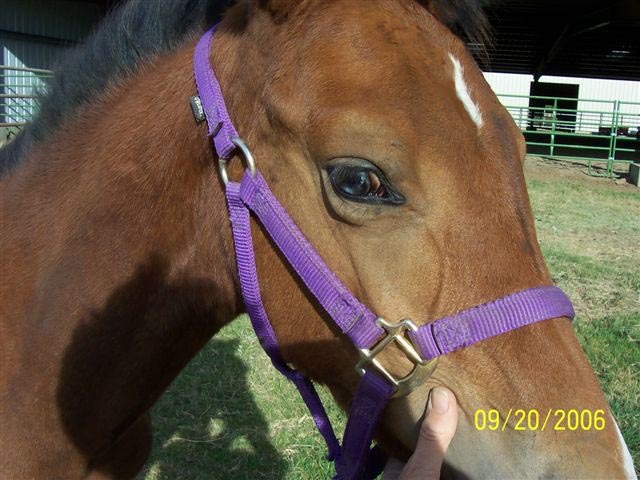 The top picture was taken in 2002 when this mare was 19. 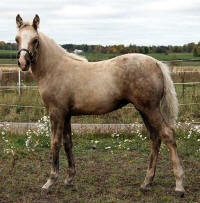 She looks very much like a rose grey, but a grey horse should be nearly white at this age. The dark mane and tail (light hairs at tailhead, but dark the rest of the way down to the tip, unlike most greys) as well as the darker legs are atypical of grays as well. There also is no known grey color line in the pedigree. 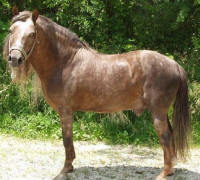 True dark headed roan horses do not dapple this much, and there is no roan line in her pedigree. Her tail-male line goes back to Easter Twilight, the maternal grandsire of another famous sabino roan, Dawnhill Storm Cloud, pictured elsewhere on these pages. There are other sabino-like lines in the pedigree as well. "Rosey's" nephew is also an odd color and is pictured below. Photos courtesy of Tammy Kastner, Tee Pee Morgans. BEN'S FLYING SILVERFIELD (Lippatink's Sealect X Hawksfield Miss Dee), 1993 chestnut stallion, who was owned by Carol Copeland of PA. In the first picture, "Ben" looks very much like a silver dapple, but both parents are registered as chestnut and the one line he has to the one known silver dapple source stallion, Dan, is through the black stallion, Black Ran-Bo. 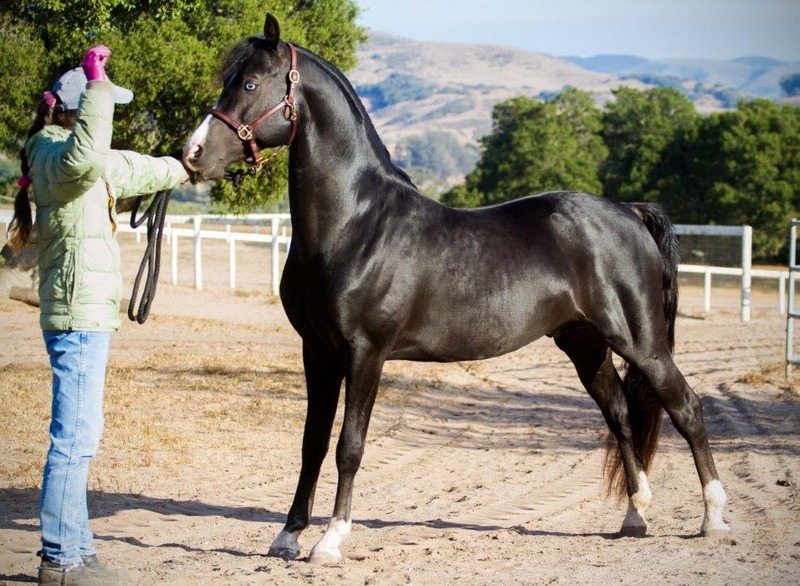 Black horses cannot "carry" the silver gene unexpressed; if they have the silver gene, they will be silvers. 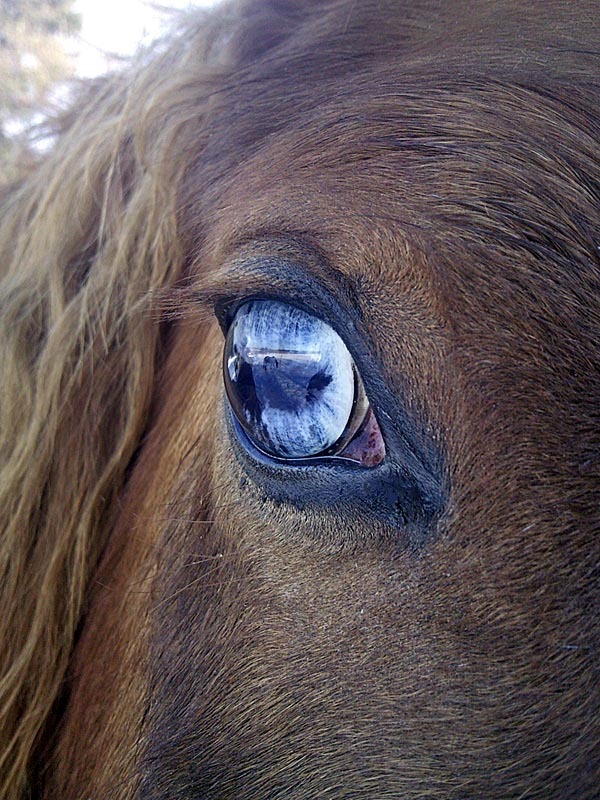 It may be hard to see in this smaller version of the original picture, but his dapples are composed of silvery white hairs rather than the beige dapples more typical of some silver dapples. He definitely looks more "roany" in the second picture. Photos courtesy of Tammy Kastner. LIPPATINK'S SEALECT (Middland Lipp A Tink X Sleepy's Fuzzy Fanny), 1977 chestnut sabino stallion (deceased), owned by Carol Copeland of PA. He is the full brother to "Rosey" pictured above, and the sire of Ben. Remember that their tail-male line goes back to Easter Twilight, the maternal grandsire of the frosty roan/sabino Dawnhill Storm Cloud. These are not the most clear pictures, but I thought it was important to share them. 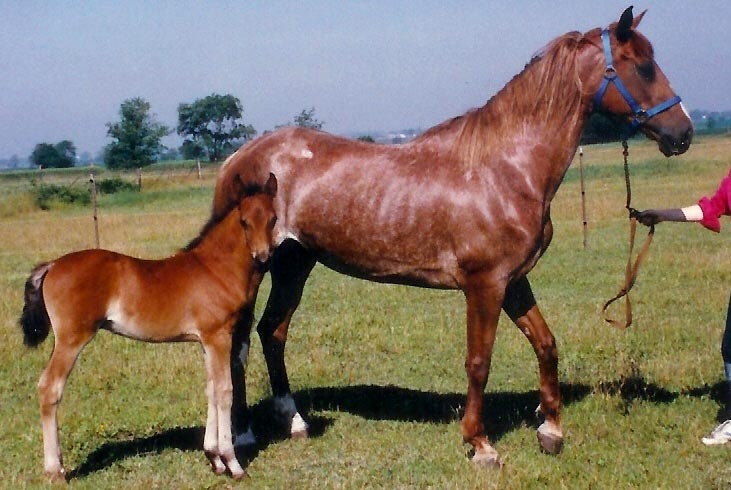 The first picture was taken in 1990 when the horse was 13. You can see the large dapples of lighter hair; this horse looks almost grey, except for the tail with the light hairs at the tailhead, instead of at the bottom where they would normally be in a grey horse. Lippatink's Sealect's only white markings were a small star and a left hind outside coronet- not markings generally thought of as "sabino". This family consistently began roaning at around age 5 or 6. Another horse from this family who was oddly colored is the late IHADASILVERDADDY (Lippatink's Sealect X Hawksfield Miss Dee), 1992 stallion owned by Michelle Dahler of NY. He was another son of Lippatink's Sealect and a full brother to Ben. He appeared to have roaning that organized itself into brindling. If you have any other information on these horses or pictures of other members of this family, please contact Laura Behning. First photo courtesy of Tammy Kastner; other two photos courtesy of Michelle Dahler. 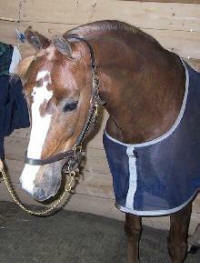 The late DAWNHILL STORM CLOUD (UVM Red Cloud X Bald Mtn. Anntwilight), 1971 chestnut gelding. 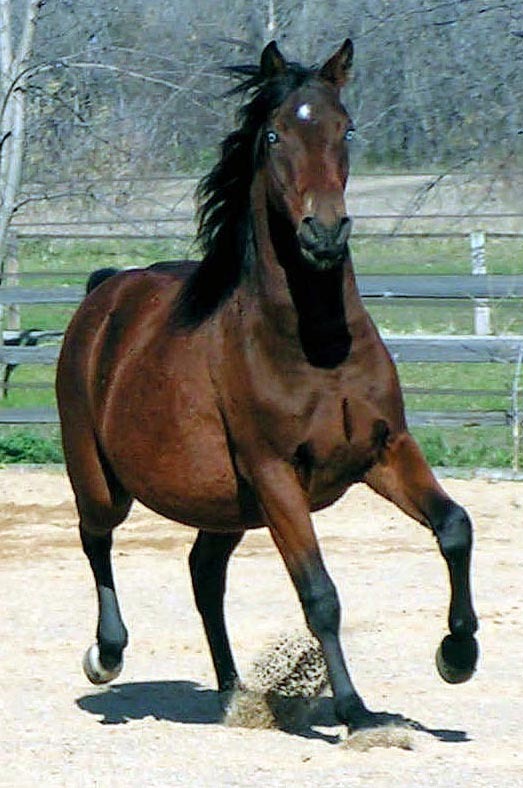 Storm Cloud was a multiple World Champion carriage driving horse owned by Lore Homer of Oreland, PA, and an excellent example all-over face and body roaning typical of sabino phenotype horses. 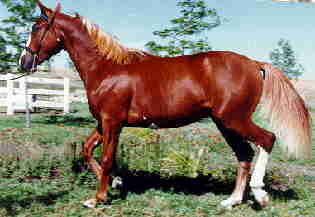 ELNORA'S CALICO BEAU (IWWH Reignbeau Jubilate X LSR Four Roses), 1995 chestnut gelding, pictured at 18 months. 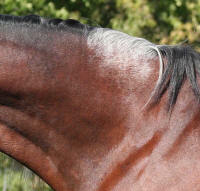 "Beau" was used to illustrate the 12/96 EQUUS magazine article on sabinos. Note the high white stocking and belly spotting, typical what is commonly thought of as sabino. 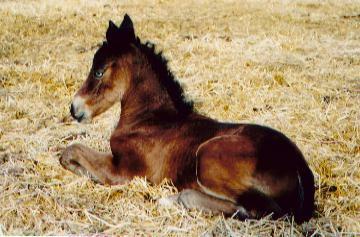 Photo courtesy of Beau's breeder Elnora Shandy. 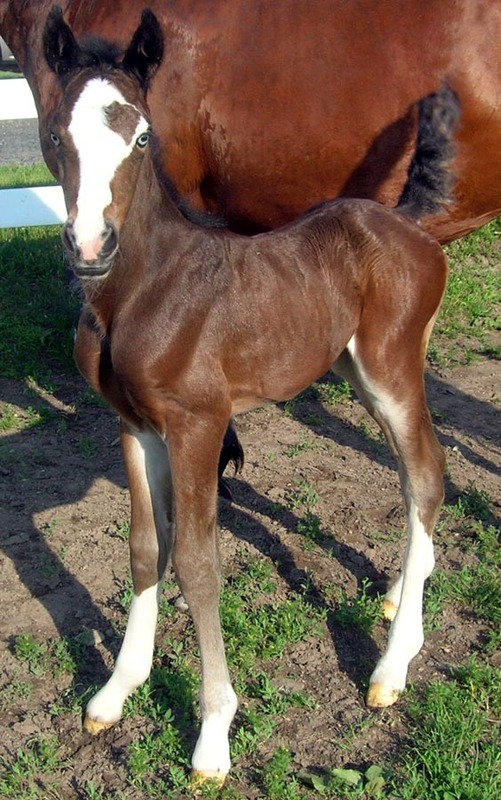 HIGH WHITE REVOLUTION (High Water Running Star X Bellemount's Magic Moment), 1996 chestnut stallion, pictured as a weanling. 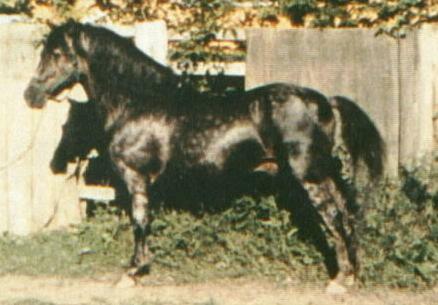 "Rebel" was bred by Sue White of Fredericksburg, VA. His hind stockings have long jaggedy extensions up the front of the gaskins, like many Sabino1 horses. The extensive, irregularly shaped "apron" blaze is also similar to sabino. T-BONE P DEDE (Pegasus Polaris X T-Bone Misty), 1977 chestnut mare, was also a roany sabino-like Morgan. Photo courtesy of Jeanne Masters. 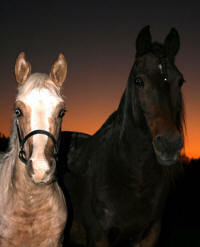 FAIRCREST DARK NIGHT (Century Nightmusic x Hylee's Diamond Fantasy), 2008 black stallion owned by Jeanne Malone. "Casper" has lots of white producing lines on both sides of his pedigree (Cedar Creek Harlequin and Serenity Flight Time, respectively). First photo by Carrie Kitley, Ghost Dance Photography. 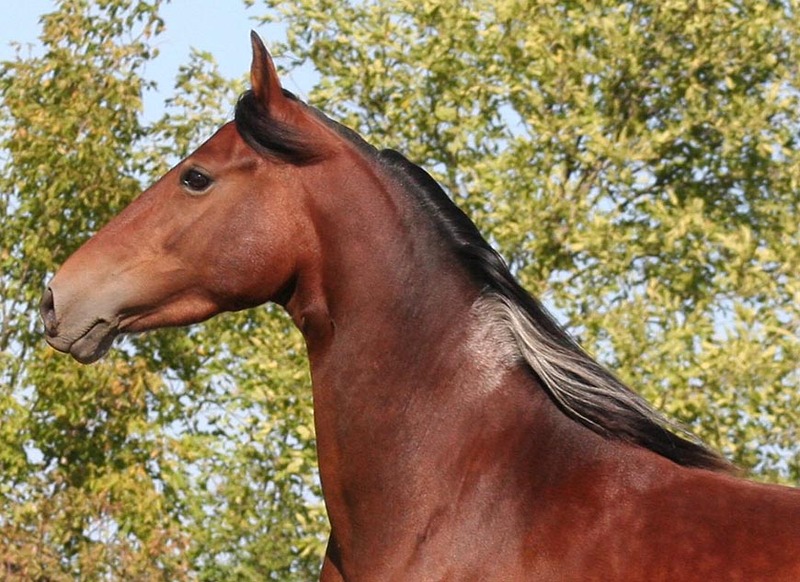 The late EXPAT'S PATRIOT (Ancan Kodachrome x Legacy's Sea Star), 2008 chestnut stallion owned by Scott and Anne Mayden, Expat Morgans, France. "Pat" has white-producing lines on both sides of his pedigree- his sire (pictured elsewhere on this page) is a son of Ancan True Colors, and his dam is a granddaughter of Chasley Superman. 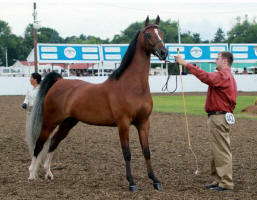 SHARP DRESSED GENTLEMAN (ZZ Top X Psychedelic Answer), 2004 bay stallion owned by Dennis Bontrager. 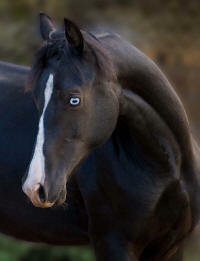 This stallion has four white feet, a blaze and one blue eye (the right). His paternal great grandsire is Cedar Creek Harlequin, a known producer of chrome, and there is Orcland Leader, another source of white, behind his dam. Photo by Anne Wyland. VS MORO MYSTIQUE (Blue Spruce High-Majestic X Moro Hill Mamosa), 2007 bay filly owned by Stonelake Morgans, GA. "Misty" is a full Lippitt. 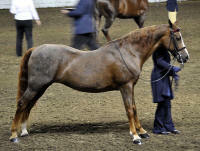 She is linebred to two Lippitts who had abundant white markings, Moro Hill Manito and Moro Hill Prophet. 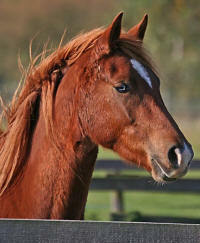 She traces to both stallions several times, on both sides of her pedigree. As closely bred as Lippitts are, one would have thought we would have seen some more chromed-out and blue eyed individuals before Misty. It is possible that this is due to selection against white markings in the Lippitt gene pool, or due to rigorous culling during the time of the White Rule (1962-1996). Photo courtesy of Misty's breeder, Brenda Vincent. 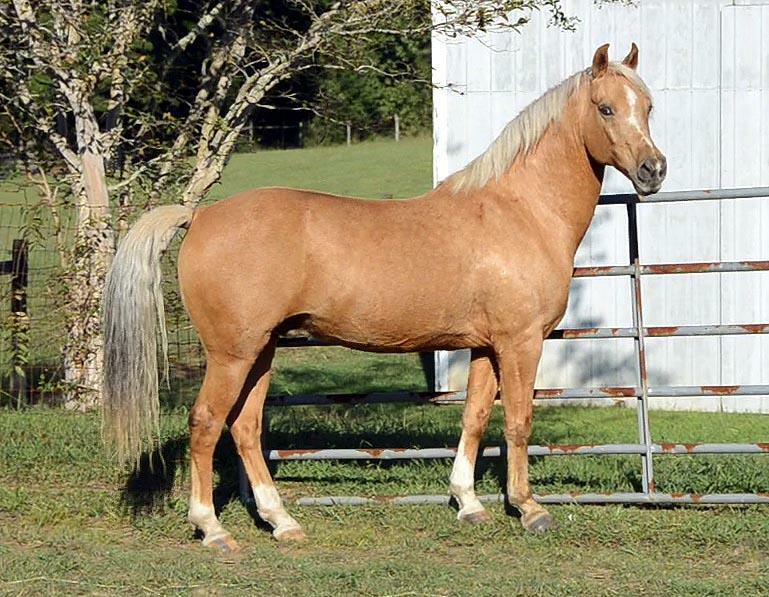 ANCAN TRUE COLORS (Fiddler's Blackriver X Aquila's Miss Bee Haven), 2002 palomino stallion owned by Anne Wyland, Ancan Morgans, Davison, MI. "Blitz" has no white on his legs, but has a skewed to one nostril, bottom heavy blaze with straight edges, along with one mostly blue eye (his left eye is brown). Several of his offspring (out of different mares) have flashy white markings and a partial blue eye. The source of white here can only be speculated upon. It is probably coming through Blitz's dam line, as his sire never produced another blue eyed individual- and he sired 85 offspring. 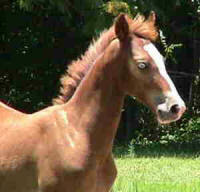 Blitz's dam, Bee, only has white hind anklets for markings, but both of her parents have white markings. Her sire Futurity Command is conservatively marked, but does have a star and snip. Bee's dam is Aquila's Queen Bee, and behind her are several horses liberally marked with white including Foxy's Cotton Queen, Foxfire and Bonfire. Queen Bee's sire Paramounts' Nominee (and his grandsire Paramount Ambassador) had a lot of white for a bay, including big snips. Other Aquila horses from these same lines have a lot of white too, like Aquila's Top Command. First photo courtesy of Anne Wyland; eye photo by Laura Behning. 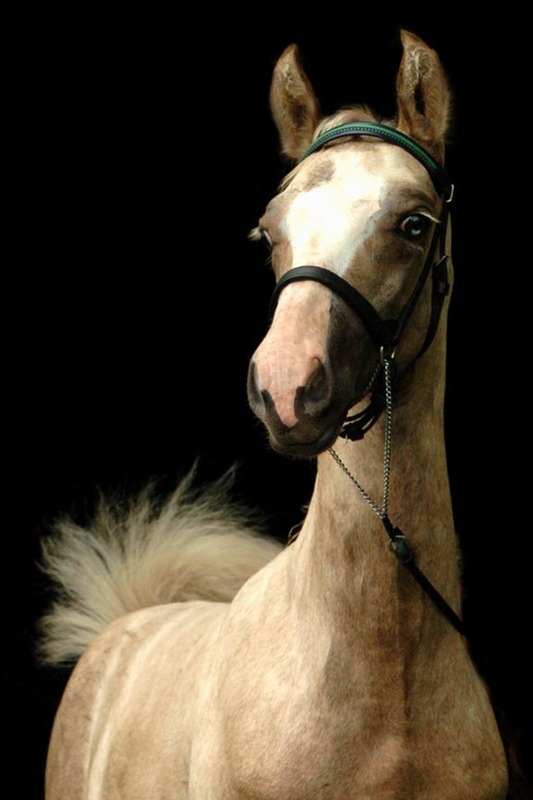 ANCAN KODACHROME (Ancan True Colors X Nocturnal Melody), 2006 palomino colt owned by Anne Singer-Mayden, Expat Morgans, Belgium. 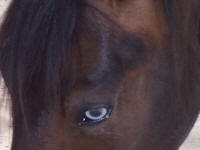 "Koda" has one partially blue eye (his left), white on both hind and the right fore as well as a big blaze. Photo courtesy of Anne Wyland. ANCAN SAND PIPER (Ancan True Colors X Ancan Second Chance), 2006 palomino filly bred by Anne Wyland, Ancan Morgans, Davison, MI. Piper does not have any leg white but has a bottom heavy blaze (it skews over to her left nostril, and there is a detached spot behind/above her right nostril) and partial blue right eye. Piper is now owned by Sue Dixon of Ammolite Acres in Alberta, Canada. 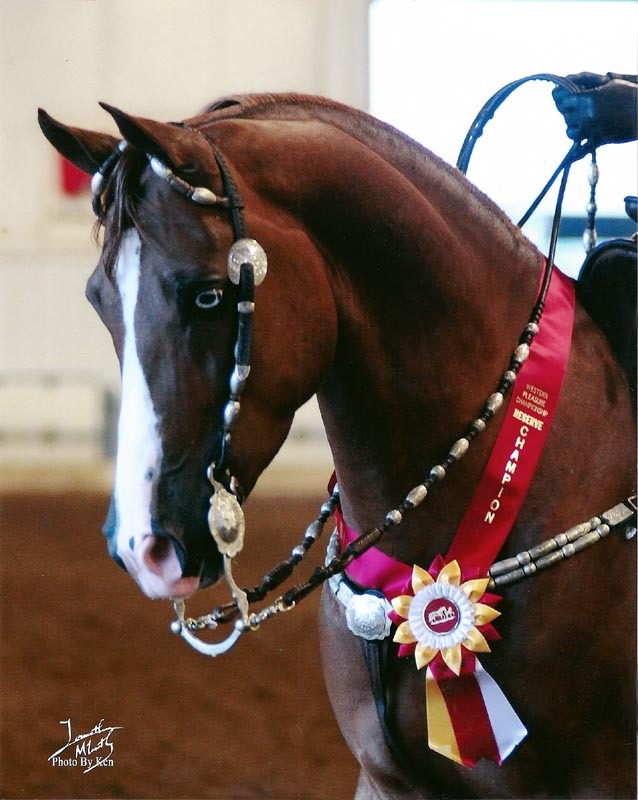 SONDARLING'S GYPSY LOVE (Higuera Sondarling X Futurity's Passion), 2003 chestnut mare owned by Anja Grell, Germany. Besides her star, offset snip and blue eye, this mare has a left fore partial coronet, left hind sock and right hind fetlock. Several of her white markings have distal spots and she is also getting roan hairs. 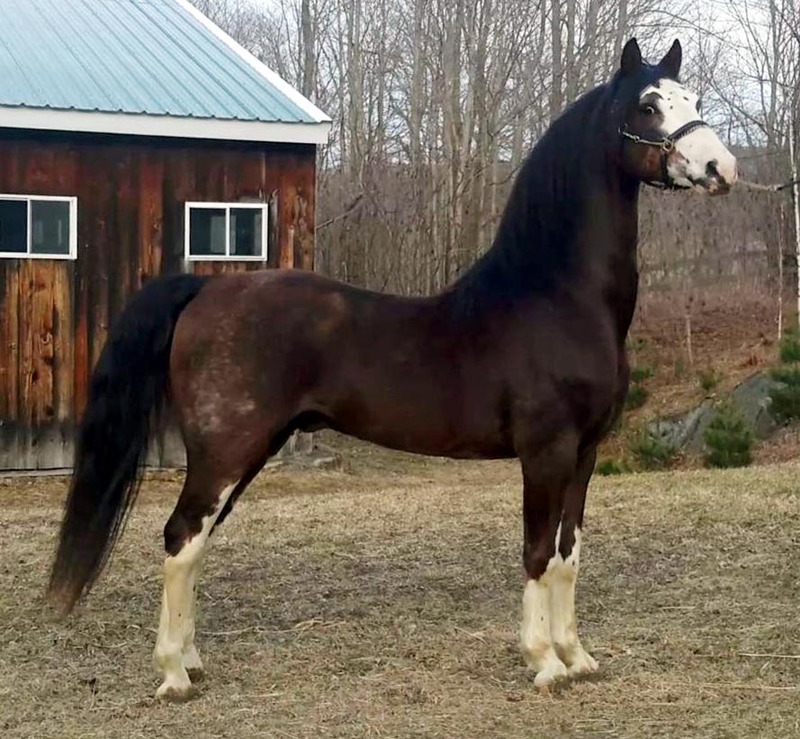 Her "chromed out" (white on all 4, star and stripe) sire has produced other horses with belly spots and high white; her dam has a star and a faint lopsided snip as her only white. There are two lines to Orcland Leader, a known source of white, through Rapidan Apollo behind her dam. NORCAL SPECIAL KITTEN (A Midnight Special X Kizzy's Kitten), 2006 bay filly owned by Gerry Paiva. This filly has one mostly blue eye (her right) and one brown eye. 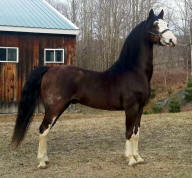 Her white markings consist of a star and snip and both hind fetlocks. While her sire is marked only with a telltale snip, Kitten's paternal grandsire is Farceur Morgan, who has a lot of white, as does his sire, Kings River Morgan. Another son of Farceur Morgan who has produced blue eyed offspring on several occasions is the palomino stallion Farceur's Fool's Gold. Photos courtesy of Gerry Paiva. ICE FARCEUR'S HONEY (Farceur's Fool's Gold X CTM Whirlwin Romance), 2007 palomino filly owned by Ingela Isetoft of Ice Morgans. Honey has one blue eye and one brown eye and a crooked, spreading blaze which skews towards one nostril. Shown on the left with her dam. Honey's white is probably coming from her sire. Photos courtesy of Ingela Isetoft. 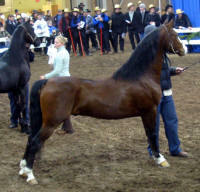 REGENCY CARROUSEL (Farceur's Fool's Gold X Aquila's Royal Satin), 2000 buckskin mare owned by Julia Allen Rose. 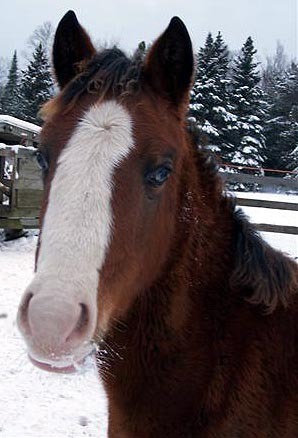 Carrousel has one blue eye- the left- and one brown eye, a big blaze, left fore and right hind white fetlocks, and a left hind sock. Like her half sister Honey above, her markings may be coming through her sireline. Photo courtesy of Erika Bronstrup. GSV REMBRANDT (Spring Hills Finnlee X Prairie Hill Mercedes), a 2004 dark bay/brown gelding owned by Valerie Larson-Lohr, has no white markings, but he does have one beautiful blue eye! 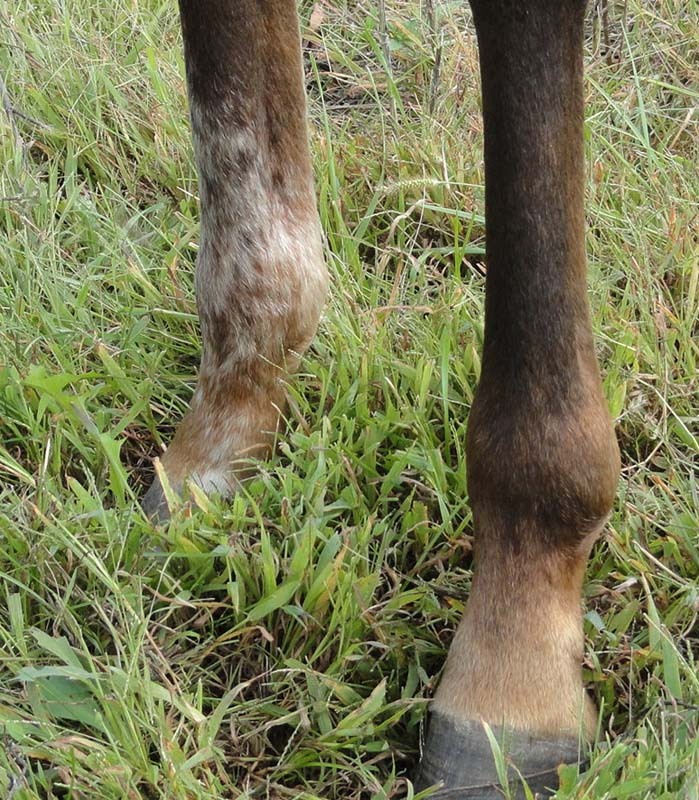 Often horses who are thought to be "solid" have lighter areas of hoof horn visible only when their otherwise black hooves are viewed from the bottom. This is thought to be a white marking that simply did not extend up onto the limb. Tiny snips of no more than a few hairs are frequently missed, as well. Rembrandt's sire is marked with just a star, but his dam has a star, a snip and a hind fetlock white. Photos courtesy of Jerri Ostendorf. 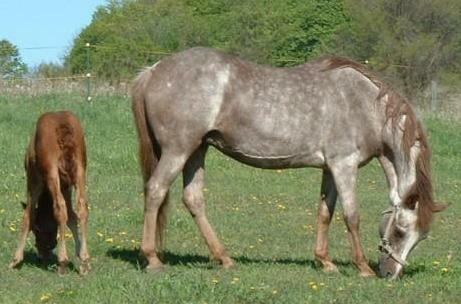 OUT OF ORDER (Whitmorr Law and Order X Molly Creegan), 2005 bay gelding owned by Carol Prindle, pictured on the left as a foal and then as a two year old. He is marked with an off center, faint snip and the two blue eyes. 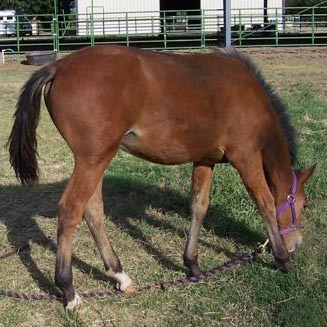 The leg white on this colt is very minimal- just two hind fetlocks. His sire Whitmorr Law and Order has Serenity Flight Time behind him, which is a line known for producing white markings. I have heard of several instances of blue eyes from horses with close up Serenity Flight Time, including the mare, Shock and Awe (complete with blue eyes and white tipped tail) by his grandson, Cedar Creek Harlequin. ULTRAS SPRIRIT OF THE LAW (Whitmorr Law & Order x Ultras America Rising), 2005 chestnut gelding owned by Amy Bearman, Bearsfield Morgan Farm. Pictured at the 2011 Michigan Futurity Show. BAY STATE FLASH OF BLUE (Homeward Middlebury x Bay State Narcissus), 2010 dark bay or brown gelding, pictured as a suckling. This cute colt's blue eyes and flashy white markings came as a surprise to his breeders, the University of Massachusetts. Several flashily marked (minus the blue eyes) Morgans have been sired by Middlebury. The Orcland Leader lines behind Flash of Blue's dam Narcissus are also known for producing white. 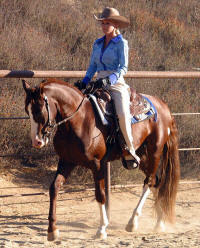 The "cut out" in the blaze and the pointy topped in front back stockings are traits commonly thought of as "sabino". Photo courtesy of Erika Botman. 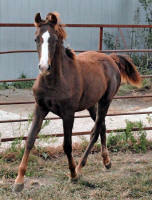 BATTERSEA PHOENIX (Battersea L'Enfant X Sunleaf's Sassafras), 1999 chestnut gelding owned by Carlton Huhn, pictured as a weanling. Photo by Lisa Holec.